2018 was a good year for the entertainment industry. Home spending on video rentals, purchases and SVOD is up 11.5% in one year, 30% since 2014. However, adding in pay TV and the box office, spending increased just 5% in four years. That’s not even enough to cover inflation! S. consumers spent $6.5 billion purchasing media and $3.9 renting it. The industry should be pleased with the 11.5% increase in home entertainment spending over 2017. Consumers spent $23.3 billion in total, up from $20.9 in 2017 and $17.9 billion in 2014. The increase is well ahead of inflation. U.S. prices increased by 6.5% between 2014 and 2018, but home entertainment spending increased 30%. However, all the increase went SVOD services. Since 2014, rental and purchase revenue has steadily declined while SVOD spending has more than tripled. The shift in spending is startling when compared with 2014. 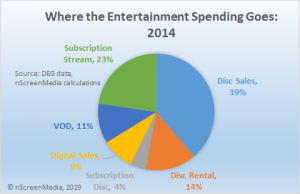 Four years ago, disc sales still represented the largest part of home entertainment spending. Consumers bought nearly $7 billion worth of discs, accounting for 39% of the total spend. In 2018, they spent just $4 billion, or 17% of the total. Disc rentals have suffered a similar fate, falling from 14% of the total spend to 6% over the same period. SVOD services have expanded dramatically over the last four years. For example, Netflix has grown subscribers from 39 million U.S. subscribers to almost 60 million. Similarly, DEG says SVOD spending has grown from $4 billion, or 23% of the total spending, to $12.9 billion, or 55% of the total. DEG does not include pay TV spending in its numbers. Adding it in shifts the spending picture dramatically. 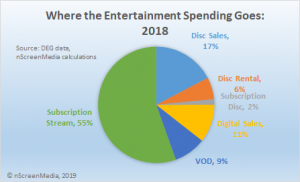 In 2018, 72 cents of every dollar spent on entertainment went to pay TV, 9 cents went to movie theater tickets, and 18% to video sales, rentals, and SVOD. However, pay TV has lost a great deal of ground since 2014. Then, 77 cents of every entertainment dollar spent went to pay TV, 9 cents to the box office, and 15% to the categories tracked by DEG. 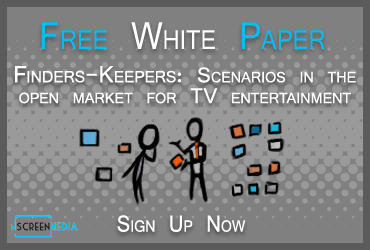 Entertainment spending is increasing with much of the gains are going to SVOD services. Consumers continue to move away from physical media toward digital. Overall, entertainment spending is not keeping pace with inflation. [i] DEG does not include revenue from Amazon Prime Video in the total since it is part of Prime membership, which also brings other benefits.